Stainless steel is the “green material” par excellence and is infinitely recyclable. Within the construction sector, its actual recovery rate is close to 100%. It is environmentally neutral, inert and when in contact with elements such as water it does not leach compounds that might modify their composition. These qualities make it a material which is ideally suited to building and construction applications: roofs, facades, rainwater recovery systems, domestic water pipes and swimming pools as well as bridges and pedestrian bridges. 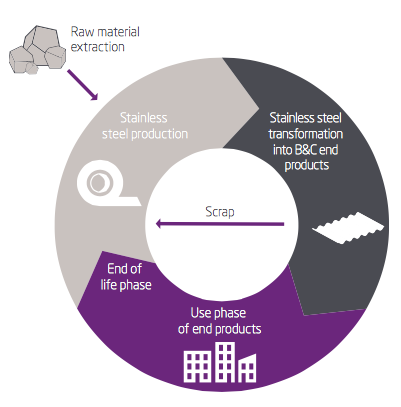 Stainless steel’s longevity fulfils the requirements of sustainable construction. A suitable choice in terms of grade, surface finish, installation and maintenance guarantees the user unrivalled service life. Construction components in stainless steel are delivered ready to install on site reducing pollution (noise, dust, etc.). Furthermore, during demolition, these can be salvaged for re-use in recycling, adding value.